Highlands Elementary School, 3150 Colwood Drive, District of North Vancouver. The dial is by the main entrance to the school. The dial is decorated with signs of the zodiac, cardinal directions, and Bailey Points to show the direction of sunrise & sunset. 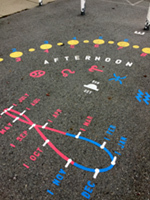 The sundial uses bright colors for appeal to the school's student age group. A number of 1-inch bronze disks are fixed into the asphalt to provide permanent reference points for repainting the dial.